"My boyfriend made me the best stuffed chicken last evening. It was so good that I crowned him a better cook than me. Serve with a small side of salsa and sour cream on the side." In a shallow bowl, mix the corn flakes, chili powder, and fajita seasoning. In a separate bowl, mix the red bell pepper, yellow bell pepper, orange bell pepper, mushrooms, and onion. Dredge the chicken in the corn flakes mixture to evenly coat. Sprinkle one side of each breast with 2 tablespoons Cheddar cheese, and layer with 1/4 the vegetable mixture. Top with equal amounts salsa. Carefully roll the breast halves over the filling. Seal seams with toothpicks, then dredge again in the corn flakes mixture. 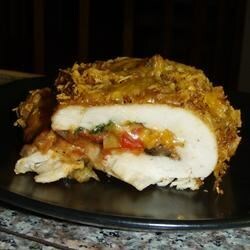 Arrange the rolled chicken breasts in the prepared baking dish. Bake 30 minutes in the preheated oven. Top with remaining cheese, and continue baking 10 minutes, or until chicken juices run clear and cheese is melted. this was ok on flavor, but the preparation was in my opinion way too much work for a 3 star meal. if i make this dish again, i will be chopping up all ingredients, mixing them up and baking. A grest dish! Served best with a side of mexican rice and a light salad. But the chicken! Man alive that chicken is so fine! Tasty has a new name "Bob's Mexican Stuffed Chicken". This has to be the best chicken I have ever tasted. I did use crushed tortilla chips insted of corn flakes. This will be a regular meal in our home. I'm emailing this recipe to all my friends. I am not big on peoppers and onions so I just used bella mushrooms and tomatoes for the filling. It was great! Everyone loves this dish.